Moonstone's humble roots began in Santiago Canyon with our head trainer, Kim Stanford, and her daughter, Sami Riffenburgh-Franco. Together, the two have worked on building their riding academy and sharing their love for horses and the equestrian sport to many others. Through hard work and dedication, Moonstone Riding Academy grew to become home to many wonderful horses and fantastic riders. We welcome you to join us and become part of our horse-crazy barn family! Dedicated to the well-being of our horses and riders. Kim started riding at a young age and competed throughout most of her childhood and teen years. Her knowledge and experience helps her with guiding her students to become better, well-rounded equestrians. She has many years of experience with equine rehabilitation, successfully bringing horses back from severe injuries into the show ring. A third generation horseman, Javier was raised around horses from a very early age. He has worked for many large-scale race trainers at Pomona Fairplex and Los Alimitos, along with several private facility trainers. He has experience working for reining trainers and has been head groom at Hunter/Jumper shows for over a decade. 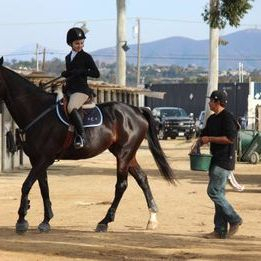 He has a love and passion for athletic, well groomed, healthy horses and takes pride in his work. Sami began her riding career at a young age and worked as an exercise rider for years. She has successfully taken green riders and horses from the basics to the show ring and has a passion for teaching. Her method includes building confidence for horse and rider through gentle guidance, correct riding, and patience. Starting at a young age, Ally has always had a passion for horses. She began riding at age twelve but certain circumstances had to put a hold on her lessons. She found Moonstone after her long break and joined the team in early 2012. 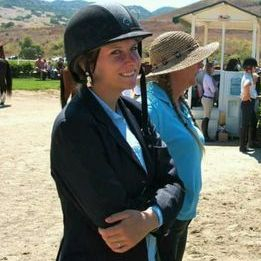 Under the guidance of Kim and Sami, she has been able to pursue her love of horses and continue riding. She greatly enjoys working alongside the horses and loves teaching younger students. Harley and Luna hold a special place here at Moonstone Riding Academy. 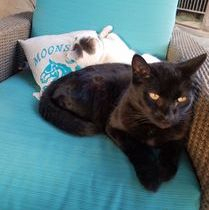 Luna was adopted into the family in summer 2013 as a kitten; Harley joined early 2015 from another barn. Both are known to many around the stables, especially Luna as she enjoys long walks around the facilities and loves making new friends. Harley prefers staying close to his favorite spot in the office and is never afraid to remind us when it's dinner time.